When I was younger, every year around Christmas time my great aunt would send an enormous tin of homemade cookies from her little apartment in Salzburg. Besides decorating the tree, getting that box was my favorite part of the holidays. And these were not just any old cookies—they were melt-in-your-mouth-possibly-laced-with-an-illegal-substance-fight-over-the-last-one-using-sneaky-tactics cookies. 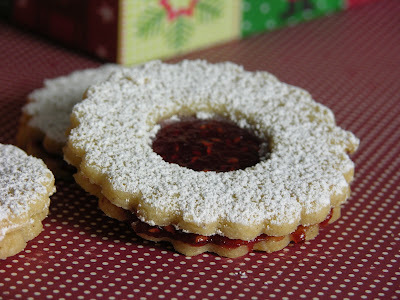 And every year the top two layers were composed of the most delicious Linzer cookies ever in the world, then vanilla “kipfels” and chocolate drop cookies. Unfortunately, working with American flour and sugar, it's been impossible to get the cookies just the way Tante Mitzi used to make them. Especially considering she stores her recipe collection mostly in her head and not on paper. 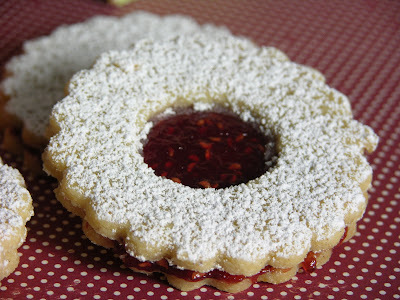 So needless to say, every Linzer cookie I try gets compared to her version, and I am still chasing after the ultimate recipe. But I came across one recently that at least rates a solid second place. Surprisingly, it was from December's Cooking Light. We've made these cookies twice in the last couple of weeks, and although they're somewhat labor intensive, they're definitely worth the effort. I think they taste best the day after you bake them, with a big glass of milk. Click here for the original recipe, but be warned, I made it way easier on you than they did. 1. Spoon about ½ cup of the flour into a dry measuring cup and level with a knife. Combine the ½ cup of flour and all of the almonds in a food processor and process until fine. Add the remaining 1 cup + 2 Tbsp of flour to a mixing bowl, and combine with almond mixture, baking powder, cinnamon and salt. Stir well. 2. In another large bowl, place sugar, butter and lemon rind; beat with a mixer at medium speed until light and fluffy (2-3 minutes). Add egg yolks and almond extract and continue beating until well blended. 3. At low speed, begin adding flour mixture gradually, beating at low speed until all flour is integrated. Beat just until a soft dough forms. 4. Turn the dough out onto a nonstick surface or piece of plastic wrap and knead lightly until smooth. Divide the dough into 3 equal portions, wrapping each piece in a sheet of plastic wrap. Chill for 1-2 hours. 5. When dough is sufficiently chilled, pre-heat oven to 350°. Roll each dough portion into about an 1/8 of an inch thickness onto a sheet of parchment paper cut to the size of your baking pan (or other nonstick baking mat). Then cut dough into shapes using a round cookie cutter, leaving a very small amount of space (¼ of an inch should do) between cookies. With each batch, remember to cut equal amounts of tops and bottoms. 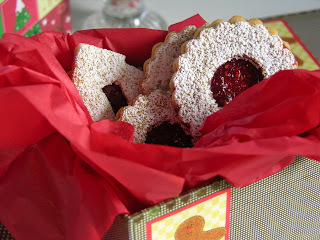 Your cookie cutter can be any shape, but round with fluted edges tends to be a traditional example. The size of the hole in the cookie top is totally up to you. Remove remaining dough around cutouts, forming it into a ball and returning it to the plastic. Place dough in freezer to re-roll later, and begin working on the next portion of dough. Repeat until all dough is exhausted. 7. In between rolling out sections of dough, bake cookies one batch at a time at 350° for 8-10 minutes. Lift the entire piece of parchment paper onto the baking sheet and place in the oven. It helps to have a few baking sheets in rotation so that one pan is being prepped to go in the oven while the other is baking. 8. After pulling the cookies from the oven, let them cool several minutes before transferring to a cooling rack. 9. Let cookies cool completely. 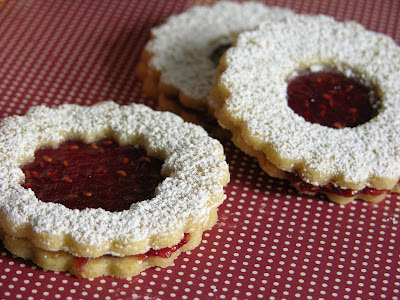 Take a butter knife and coat the bottom half of the cookies with a layer of raspberry jam. Use a sifter to coat the tops (the ones with the smaller holes) lightly with powdered sugar. Place cookies together to form a sandwich. Sample cookies with cold glass of milk. Es schmeckt gut! 1. It helps to have several baking sheets so that you can rotate pans, having one ready to go in when taking the other out of the oven. 2. If you're working with parchment paper, it can be re-used for the duration of your cookie-baking adventure. 3. When rolling out the dough, make sure to lightly flour your rolling pin to avoid breakage and tearing. 4. When cutting out cookies, cut in even numbers and go ahead and cut matching tops and bottoms so you don't end up with too many of one side. 5. Use a fresh bottle of jam so that it's at room temperature for best flavor and texture. Great cookies! they look delicious.